Illinois Lawmaker Found Guilty Of Accepting $7,000 Payoff : The Two-Way The jury didn't buy state Rep. Derrick Smith's argument that the repeated efforts to get him to accept the money amounted to entrapment. 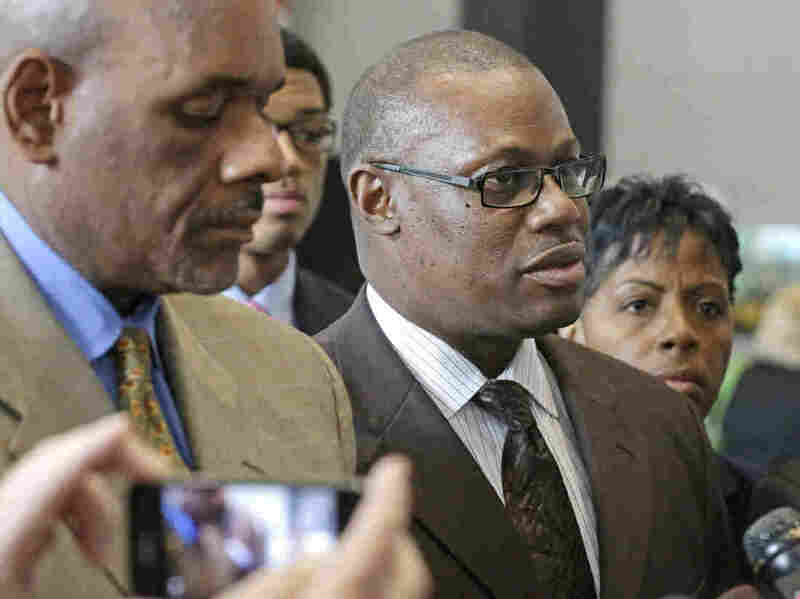 Illinois state Rep. Derrick Smith (center) speaks to reporters at the federal building Tuesday after a jury convicted him of bribery. In a case in which some observers suggest the FBI may have gone too far to snare a politician in a bribery scheme, a jury has convicted an Illinois lawmaker of corruption. The verdict against State Rep. Derrick Smith relates to the then-freshman representative's acceptance in 2012 of a $7,000 payoff from an FBI informant. The jury agreed with the prosecution that Smith abused his office for personal gain. The defense had argued that the representative repeatedly refused the bribe before finally relenting and that the undercover sting amounted to entrapment. "We gave it a good fight," Smith told reporters after the verdict was read. "It's God's will. God knows the truth about it all. The jurors just didn't see what God saw." The lawmaker was caught on tape in a secret meeting in his car with a man identified only as "Pete" who is said to have been a campaign worker for Smith. The representative is heard counting out, then pocketing an envelope full of cash. In FBI recordings, Smith referred to the cash as "cheddar" and talked about how to get paid without getting caught. Federal prosecutor Marsha McLellan, in her closing argument on Monday, told jurors that Smith, 50, "took advantage of his office to put cash in his pockets." As we reported on Monday, the government says he took the bribe from "Pete," a felon turned government-informant, in exchange for writing a letter of recommendation on behalf of a day care center operator in his district who was seeking a state grant. The undercover recordings showed Smith was initially very reluctant to take cash from the informant, and that he resisted and rebuffed "Pete's" attempts to bribe him several times. According to The Chicago Tribune: "In his closing arguments to the jury, Smith's attorney, Victor Henderson, said Smith was guilty only of 'bad judgment' in trusting his campaign worker. ... Henderson also hammered repeatedly on the FBI's handling of the investigation, saying agents concocted the day care scenario in order to charge a politician and advance their careers." FBI agents testified that after he was arrested, Smith admitted to agents that he had accepted $7,000 in exchange for the letter of support and, accompanied by agents, he retrieved $2,500 from beneath a chest at the foot of his bed at his home and returned that money to the agents. During her closing argument, prosecutor McClellan showed the jury Smith's own words projected onto a large video screen in the darkened courtroom, saying he wanted to be paid in cash so there was "no trace" of the money, and referring to the payoff several times as "cheddar." "These are not the words of a publicly elected official who is supposed to be doing his job," McClellan said. That's the evidence the jury believed in returning the guilty verdict. Under Illinois law, Smith automatically loses his legislative seat. But he was already a lame duck anyway, having lost the Democratic primary in March.